Office letting activity in Dublin performed well in Q4 2011, with 58 of the 176 individual lettings completed in the city during 2011 being signed in Q4. In total, 35,588m2 of office lettings were signed in Dublin during the period. This brings total take-up in the Dublin office market in 2011 to an impressive 162,509m2 which represents a 24% increase in letting activity in the capital compared to the previous year and more than double the level of take-up achieved in the Dublin market in 2009. The fact that office take-up in the capital in 2011 was consistent with the ten year average level of letting activity in Dublin is encouraging considering the economic backdrop in Ireland and the Eurozone generally. Although there was no discernible decline in occupier appetite for Dublin office accommodation in the fourth quarter of 2011, it remains to be seen if the volume of demand and outstanding requirements will be maintained in 2012 and if take-up holds up. With many corporates likely to curtail their expansion and relocation requirements until such time as the economic climate is more certain, we anticipate that total take-up in the Dublin office market may decline to approximately 130,000m2 in 2012. The majority of office transactions signed in the Dublin market in 2011 comprised 10 year lettings with break options at Year 5. Most also included some element of rent-free. A trend that has emerged over the course of the last year is that an increasing number of companies are exercising break options in lease contracts. 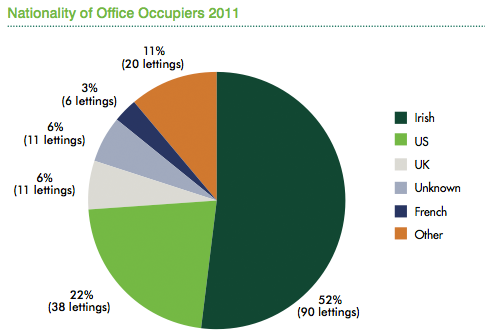 62% of the office lettings signed in Dublin during Q4 2011 were located in the city centre. Total take-up of 13,594m2 was signed in the suburbs in Q4, although this was down almost 20% compared to the previous quarter and was buoyed by a small number of larger transactions. Despite the fact that the development pipeline is now firmly halted and take-up is continuing at a healthy pace, the headline vacancy rate for Dublin offices actually increased slightly in Q4 2011 to almost 23% with over 830,000m2 of office accommodation being officially marketed to let in the Dublin market at the end of the fourth quarter. Although underlying levels of take-up continues to remove some stock from the market, net absorption is low and incidences of availability continue to materialise as companies consolidate operations and attempt to let or sublet excess accommodation. CBRE research indicates that over 70% of the office accommodation being marketed to let in Dublin at year end was classed as Grade A accommodation. However, almost 50% of this Grade A vacant stock is located outside of the city centre while much of the Grade A accommodation in the city centre comprises floors in otherwise occupied buildings as opposed to large concentrations of accommodation in individual buildings. Following a year in which there was very limited transactional activity in the office investment sector, the announcement during Q4 in Budget 2012 that the Government will not now be proceeding with controversial retrospective rent review reform was broadly welcomed. This coupled with a welcome reduction in the rate of stamp duty from 6% to 2% along with a capital gains tax waiver on properties purchased before the end of 2013 should stimulate transactional activity and stabilise capital values in the investment sector of the market in 2012. In total, there were 58 office lettings, extending to 35,588 m2 signed in the Dublin office market during Q4 2011. 21,994 m2 or 62% of overall office take-up in Q4 occurred in the city centre while the suburbs accounted for the remaining 38% or 13,594 m2 of lettings signed in Dublin in the period. 90 of the 176 lettings signed in Dublin in 2011 were to Irish companies; 38 lettings were to US companies; 11 lettings were to UK companies with the remainder of lettings being to occupiers from a range of other jurisdictions. Research indicates that 52% of the office take-up in Q4 comprised lettings of smaller than 929 m2 in size. 10% of the quantum of accommodation let in the period were lettings extending to between 929 m2 and 1,858m2 in size while a quarter of Q4 office take-up in the capital comprised lettings of between 1,858m2 and 4,645m2 in size. There were no lettings of more than 9,290m2 (100,000 sq ft) signed in Dublin in the last quarter of the year. Some of the more significant office lettings signed in Dublin during the period include the letting of 4,961m2 to UCD at Blocks 9 and 10 at Belfield Office Campus and the letting of 3,902m2 to Mastercard at Number One Central Park in the south suburbs. of new development in the office sector, older office buildings which are being vacated in favour of newer alternatives continue to be added back into the vacant stock. In addition, many companies are attempting to sublet or assign excess accommodation at present and this is maintaining the overall level of vacancy at relatively high levels despite the underlying level of letting activity. The word ‘vacancy’ is an anomaly on the basis that not all of the accommodation being marketed to let is actually ‘vacant’ with many companies attempting to sublet or assign excess accommodation in the current climate. According to our research, there was approximately 830,000m2 of office accommodation being marketed to let in the capital at year-end 2011. There are significant variations at a district level and the stock of ‘Grade A’ accommodation continues to decline in all locations although this trend may reverse to some extent in 2012 and beyond as some good quality second-hand buildings come back on the market to re-let. Demand for office space in Dublin increased in Q4 2011 compared to the previous quarter. There was approximately 105,000m2 of outstanding requirements for office accommodation in Dublin at then end of the quarter, with almost 60% focussed on Dublin city centre. It remains to be seen if demand levels will hold up over the coming quarters with some decline inevitable considering the economic climate and ongoing concerns at a Eurozone level. Tenants in the business services sector accounted for the greatest proportion of office lettings signed in Dublin during Q4 2011, accounting for 36% of lettings in the capital in the period. The public sector and consumer services sectors accounted for 18% and 17% of office take-up in Dublin in Q4 respectively while the computers and high tech sector accounted for 14% of letting activity in the period. Tenants in the financial services sector accounted for 9% of lettings signed in Dublin during Q4. Aggregate take-up in the main European office markets in Q3 2011 was roughly stable on both a quarterly and annual basis. Demand patterns remain irregular however, with falls in a number of cities like Frankfurt and Milan counterbalanced by notable upturns in Paris and London. Across all markets, there is mounting evidence that occupier sentiment is deteriorating in response to the uncertain economic outlook. Having declined for two consecutive quarters, the CBRE EU 27 Vacancy Rate Index rose marginally by 5 basis points from 10.2% to 10.25% in Q3 2011. This primarily reflected increases in a number of large markets such as London, Frankfurt and Madrid. Conversely, the vacancy rate has continued to trend downward in Moscow and to a lesser extent, in Paris. Within each market, as is clearly the case in Dublin, a growing proportion of vacant space is concentrated in inferior quality buildings as occupiers release poorer quality accommodation back onto the market. As in the previous quarter, most European markets saw no change in prime rents over the third quarter. The CBRE EU 27 Office Rent Index rose by just 0.1% in the quarter. Moscow was one the few markets to buck the trend and saw rents rising by 9.5% in the quarter. Despite the softer rental growth outlook, the polarisation of rents between prime and secondary buildings is expected to continue. Most offices markets are now seeing very low levels of new office completions at this point of the development cycle, with total completions in Western Europe in 2011 expected to run close to levels last seen in the mid 1990’s. With few exceptions, aggregate completions are expected to remain low also through 2012. 2013 is unlikely to bring any major change, reflecting the weakness of current starts as development finance remains restricted and rents remain below levels to justify speculative development. Dublin is the only market where there is no new speculative office development underway. In clear contrast to the occupier sectors of the Irish market, where take-up in 2001 was boosted by tenants taking advantage of the ability to negotiate favourable lettings with landlords and letting activity continued at pace, the investment sector of the Irish commercial property market was effectively on hold for 2011. With huge uncertainty around the issue of rent review reform and debt largely constrained, there were only eight investment transactions totalling approximately €187.8 million completed in the Irish market during the year. 4 of the 8 investment transactions concluded in Ireland in the 12 month period comprised office investment transactions with the only office transaction to sign in Q4 being the sale of Wilson House in Dublin for approximately €6.125 million. Two significant office investment assets were brought to the market towards the end of 2012 and there was genuine appetite from a range of potential buyers (mostly overseas) for these assets although neither sale had completed by year-end so these sales will ultimately be recorded as 2012 transactions. The announcement in Budget 2012 that the Government no longer intend pursuing retrospective rent review reform was broadly welcomed by the investment community and along with a capital gains tax waiver on properties purchased before the end of 2013 and a welcome reduction in the rate of stamp duty on commercial properties from 6% to 2% should stimulate transactional activity and boost values over the course of 2012. Indeed, according to the Investment Property Databank (IPD), total returns in the Irish market increased by 2.8% in the final quarter of 2011, while capital values increased by 0.2% in the period. For the year as a whole total returns in the Irish investment market fell by 2.4% while capital values declined by 11.4% in 2011. 2012 will see this trend of declining values reverse and commercial property values starting to stabilise. Prime yields are expected to strengthen once there is meaningful transactional evidence although secondary yields are expected to remain under pressure considering that investor appetite is firmly focussed on prime opportunities.